East Jakarta Mayor, Muhammad Anwar distributed aid for fire victims at RT 02/03, Klender Urban Village, Duren Sawit, Wednesday (10/10). This aid is from East Jakarta Muslim Charitable Donations Board (Bazis).
" 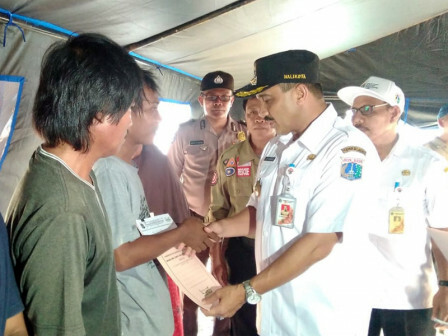 All distributed aid is from zakat, infaq, and shadaqah managed by East Jakarta Bazis"
He mentioned, there are 21 victim families in this fire incident and each families will get Rp 42 millions from Bazis. "All distributed aid is from zakat, infaq, and shadaqah managed by East Jakarta Bazis. We hope this aid can alleviate fire victims burden in fulfilling their needs," he conveyed. East Jakarta Bazis Head, Dwi Busara stated, his side gave aid to the victim because Social Sub-dept. 's emergency tent will be unloaded on Wednesday. Tents are only provided for six days after fire incident. "Their houses can't be occupied because of burning. While cleaning their houses, they need to rent a house temporarily. We want to help ease their expenses with this aid f rom ZIS 2017," he said.